After years of filming B-grade movies and unmemorable television dramas, Ethan Ruan (阮經天) is finally seeing a revival in his career. The Taiwanese actor, who shot to fame in 2008 after starring in the idol drama Fated to Love You <命中注定我愛你>, was once considered one of Asia’s biggest stars in the late 2000’s. Following his big break in Fated to Love You, the actor then starred in the 2010 film Monga <艋舺>, in which he won Best Leading Actor at the Golden Horse Awards. However, the actor’s career stagnated after dating fellow actress Tiffany Hsu (許瑋甯), and his image took a blow after their split, when it was revealed that Ethan had cheated on Tiffany several times during their relationship. Ethan attempted a new in Mainland China, which was met with mediocre results. 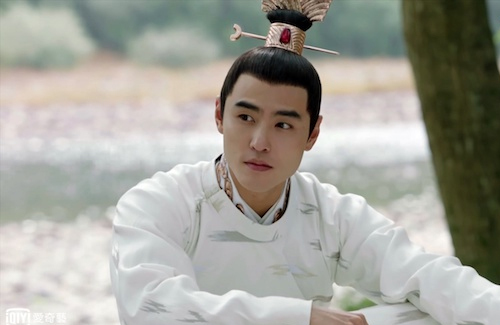 Legend of Fuyao took five months to complete. An action-packed story, Ethan was involved with many stunts throughout the show – one, in particular, was an intricate action scene with Yang Mi in a bath. Reportedly, the scene was so physically demanding that Ethan ended up passing out several times. @tiffany yup, started with princess agent! Though to be fair, in the book, it’s one of the titular scene that show development between the two leads. However, for Fuyao, they just copied that idea. @littlefish The first bath fighting scene I ever saw was in Duke of Mount Deer (2000) with Monica Chan. @peachyogurt for sure, bath scene has been done before. But recently it has come back again, and that I think due to princess agent 🙂 and if you read my comments, I’m actually not a big fan of that drama, but it was quite popular that other dramas will redo some of the famous scenes lol. And back then TVB was quite creative 🙂 and that’s why a lot of TVB plots/scenes were used by cdrama for a long time! (The catching someone mid air and slowly descent while spinning >_> hello Louis koo’s Return of the condor hero lol) how I missed the old TVB! Yeh…And they still can’t get enough of it. Maybe the mainland audience think it’s cute. They like everything romanticized into an idealistic world. That’s why there are so many written online web fantasies get made into tv dramas. Maybe the Chinese viewers like to dream but I prefer series to showcase reality…. @jimmyszeto lawl all their lead male character has to be smart, cold, dashingly handsome! If they are warm and loving = not real! Because warm loving guys in reality is sooooo much harder to find in real life than cold handsome guy that treat you like dirt! Lots of pork chop ugly looking chinese fans delusionally dreaming that one day they can get with their idol. The same idols that when onscreen have every freckle and facial mark are edited out to make them flawless.